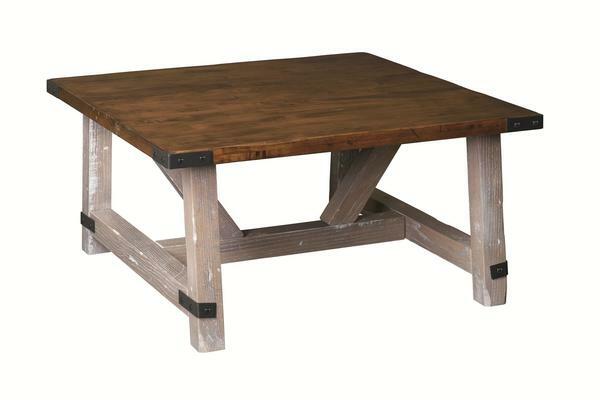 We're going all the way with rustic style with the very inviting Amish Olde Farmstead Square Coffee Tables. Thick top is supported by wood beams and accented with hand hammered steel band accents. Distressing options are available for these beauties to create a time-worn, vintage look. The Amish Olde Farmstead Square Coffee Table contributes to that relaxed, inviting look we love for living rooms. This accent table is completely customizable to suit your personal style. Distressing techniques add to a rustic style. Tools are used on the wood to create signs of wear and aging, contributing to a "loved and worn" look. Light to heavy distressing is available for this table. Learn more about distressing techniques on our blog and in our fun video library. Ready for solid wood furniture that you won't have to replace and that you can customize to fit your home? We are too! Email or call us today with any questions. We can't wait to connect you to new Amish furniture. Thank you for shopping with us.